The Digest: A Marijuana-Derived Medication Is Now Approved For Sale in the U.S.
A BREAKTHROUGH DECISION. For the first time, the U.S. Food and Drug Administration has approved a medication derived from marijuana. It’s called Epidiolex. GW Pharmaceuticals developed the drug to treat two rare forms of epilepsy that manifest during childhood, Dravet syndrome and Lennox-Gastaut syndrome. In clinical trials, the medication reduced patient seizures by up to 40 percent. TREATING THE UNTREATABLE. Children with Dravet and Lennox-Gastaut syndrome typically experience multiple types of seizures, as well as learning problems and intellectual disabilities that often prevent them from ever living “normal” lives. There are already six drugs on the market that treat Lennox-Gastaut. But there aren’t any approved medications for Dravet syndrome. That means Epidiolox could be patients’ only hope at treating their debilitating illness. Even more, doctors could choose to prescribe the medication “off-label” (for conditions not officially approved), expanding the number of patients it could help. RELIEF, NOT RECREATION. Epidiolex contains cannabidiol (CBD), one of the two main compounds in cannabis. 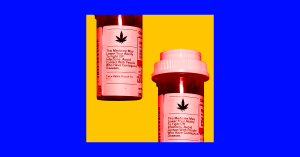 Unlike the other compound, delta-9 tetrahydrocannabinol (THC), CBD doesn’t produce a “high,” so users of Epidiolex won’t get the same buzz from using the medication that a recreational user expects to get from smoking THC-containing marijuana. Still, before GW Pharmaceuticals can sell Epidiolex, the U.S. Drug Enforcement Agency (DEA) needs to recategorize CBD, which means rethinking marijuana, too. Marijuana is currently a Schedule I drug, meaning it doesn’t have any medical value; the FDA approval shows the government thinks CBD does have medical value. According to a STAT report, the FDA expects that DEA will reclassify marijuana within the next 90 days. So we could be just a few months away from seeing a marijuana-derived medication hit the American healthcare market.